The route of the 2013 Tour de France was presented in Paris today, including a standout stage that features two ascents of Alpe d’Huez and a night time finish in Paris. The race will also take in a climb of Mont Ventoux, but only features one full Pyrenean stage and there is little in the north of the country. The 100th edition of the race starts on the island of Corsica with a flat road stage that will present Mark Cavendish with his first ever opportunity to pull on the leaders yellow jersey. His move to Belgian team Omega Pharma-Quickstep will see him have a team built around him as he goes on the hunt for maximum stage wins. After three stages on Corsica the race returns to the mainland and a short, 25km team time trial around Nice. Another three flat stages along the coast and the riders hit the Pyrenees. Stage eight sees the riders tackle the Col de Pailhéres before a finish at the top of Ax 3 Domaines. the next stage tackles five mountains on route to the finish in Bagnéres-de-Bigorre. A transfer to the north takes the race briefly to the north west of France. After a stage to Saint Malo and a time trial to Avranches the peloton will be heading south to Tours, and just three stages later is a 242km stage to the top of mont Ventoux. A transitional stage and the second individual time trial takes the riders to the stage that makes history with two ascents of Alpe d’Huez. Starting in Gap the riders will tackle the Col de Mnse, Col d’Ornon before heading up Alpe d’Huez for the first time. Once through the ski resort the riders continue up over the little used and little known Col de Sarenne with a summit at 1,989m. The descent brings the riders out near the bottom of the descent Col de Lauteret from where it’s a quick ride back round to Bourg d’Oisans from where they turn back up the Alp. And that’s just the first day in the Alps. the next day sees more climbing on the road to Le Grand-Bornand and the day after promises fireworks with a short stage of 125km to Annecy-Semnoz. The final twist in the tale of the 100th edition of the race is a night time finish on the Champs-Élysées. The planned finishing time is 9.45pm, as the sun sets. And in a break from tradition, the riders will go around the Arc de Triomphe, rather than turn 100m short of it. 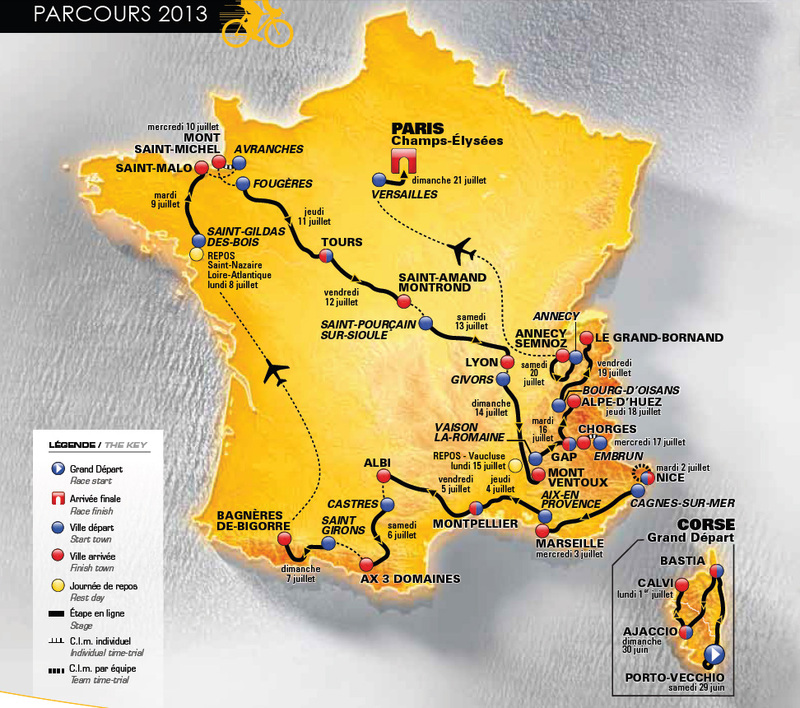 The whole of the route is within France, prompting the logo 100% French, for the 100th edition. When interviewed after the presentation, 2012 winner Bradley Wiggins confirmed that he will focus on the Giro d’Italia next year, rather than defend his Tour title. However he said he would be on the Tours start line but in the role of team mate. Chris Froome is expect to be Team Sky’s Tour leader in 2013.